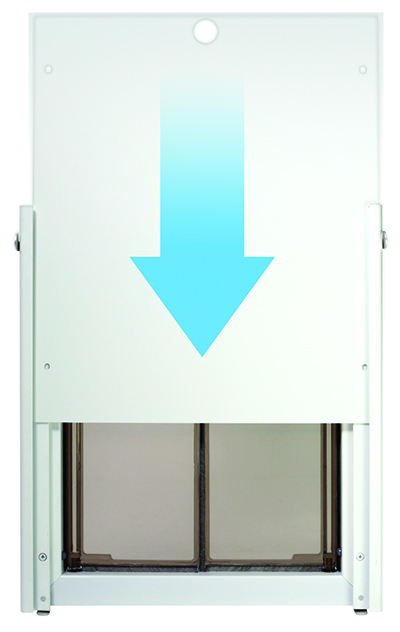 During the past few decades, technological progress has moved forward with incredible speed. Thus far it's been mostly aimed at humans, but in the future, dogs can also be users of technology. The FIDO project is an interesting example. FIDO stands for Facilitating Interactions for Dogs with Occupations, and the goal is better communication between dogs and humans. Working dogs do everything from assisting disabled persons to detecting bombs, and this interaction would work even better if we understood each other better. The FIDO project tests new systems using its Inter-species interaction lab. It sounds like something from Star Trek, but it is real. Fox News gives examples. Military dogs could use technology to mark the location of a bomb and move to safety. Today, they have to stay with the bomb and bark until the handler arrives, putting both dog and handler at risk. 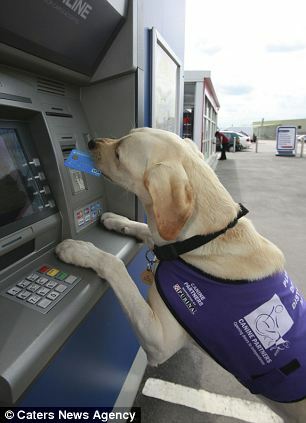 In the long run, a dog might wear a vest with sensors connected to a head-mounted display for the human. When the dog touches a sensor on the vest, a message could show on the display. Who knows. Maybe in the future dogs will be able to tell us exactly what they feel and want, not just through hoping we understand their body language, but through words that makes sense to us bi-peds. 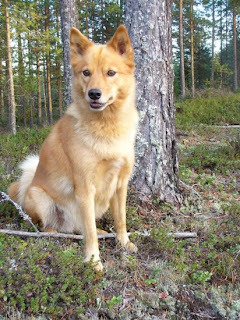 The Finnish Spitz is the national dog of Finland, and it is also known as the Suomenpystykorva. Say that ten times fast! 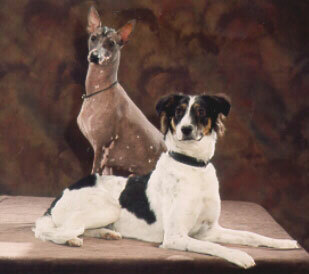 These dogs were originally bred for hunting small game and birds, but they're often used for moose and even bears. 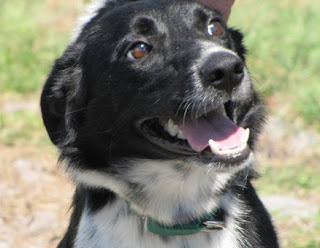 These dogs are lively, intelligent, quick, and friendly, and love being active and spending time with the family. They're known for loving children, and usually get along well with other dogs. Being a barking hunting dog, they bark at anything out of the ordinary, and their country of origin hosts barking competitions. A Finnish Spitz can bark up to 160 times a minute! They can be trained to bark less, but it does make them excellent watchdogs. 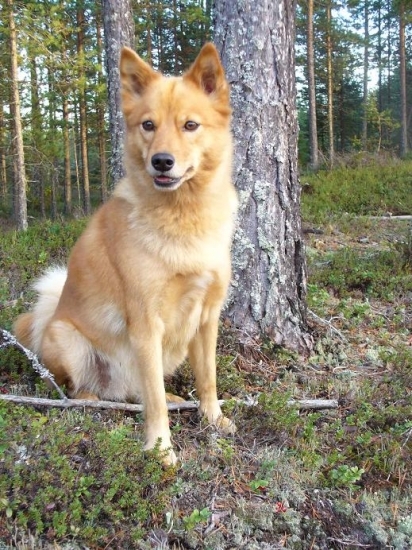 The Finnish Spitz is a healthy breed, and their median life span is around 11 years. Did you ever wonder about the concept of Crazy Cat Lady? Why couldn't it be Crazy Cat Man? 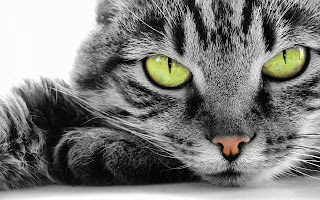 The University of Vienna has made a study on cats and cat owners, and it turns out that cats are more likely to initiate contact with women, and that cats and females develop closer relationships than cats and men. Relationships between cats and their owner mirror human bonds. Especially if the human is a woman. Cats attach to humans, particularly women, as social partners. Not just for the sake of obtaining food. 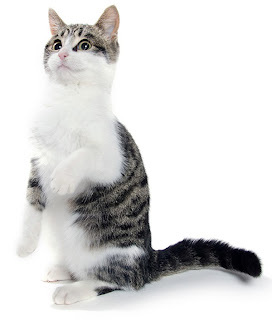 Cats and owners influence and control each other's behavior. There are plenty of male cat lovers too, of course. The study concludes, "A human and a cat can mutually develop complex ritualized interactions that show substantial mutual understanding of each other's inclinations and preferences." We understand each other pretty well! There are many Youtube videos with well trained dogs. I personally like this one. I showed the video to my doggies the other day and said, "See and learn. After you watch we'll go do all this stuff." They looked at me as if saying, "Mom, you're silly. Leave us alone!" A slight disclaimer might be in order: The video mentions a dog training company. We are in no way affiliated with them. I don't know anything about them. I do like the video and the dog! The Swedish Vallhund - also called Västgötaspets - is a small, sturdy, and fearless dog. It stems back to the Vikings over 1,000 years ago, and some historians believe they were brought to Wales around the year 800, forming part of the ancestry of the Welsh Corgi. 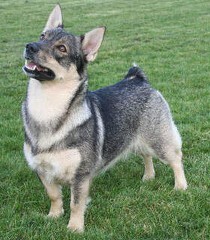 The Swedish Vallhund is an original species, meaning it did not come from another breed of dog. These dogs are traditionally used to herd cattle, catch vermin, and guard the home. 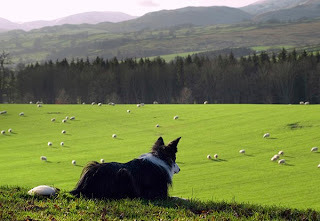 Today, they excel at obedience, agility, tracking, herding, and flyball. They're intelligent, alert, and eager to please at the same time as they are athletic and active. As long as they get some daily exercise they make great pets. In Sweden, docking of the tail is not allowed, but some Vallhunds are still seen with bobtails; they can be born with no tail, with a stub tail, or with a full tail. The Vallhund has been pictured on stamps around the world. Some of the countries featuring it are Sweden, Nicaragua, Ukraine, Mali, and Russia. 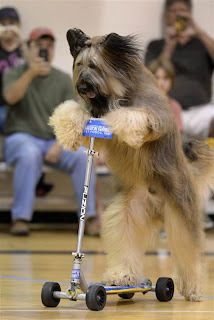 Canine freestyle is a dog sport mixing obedience training, tricks, and dance. The sport is also called musical freestyle and freestyle dance. Any move is allowed unless it puts the dog or handler in danger, and the dance routines typically include the dog doing twists and turns, weaving through the human's legs, walking backwards, jumping, and moving in sync with the human. This sport requires mastery of basic commands, and before putting a routine together, the dog must learn each individual move. 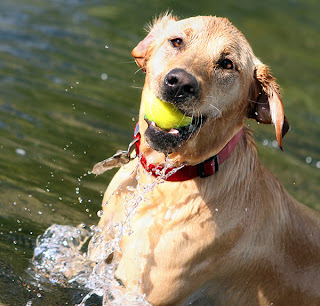 The dog must also be able to work on both sides of the human's body, not just the left as in standard obedience training. This is a sport better seen than described. Here's a video clip from Britain's Got Talent! I've always said "No" to my dogs and assumed they'd eventually understand that "No" means "Stop whatever it is you're doing." It has worked well with some of them. With others, not so much. Dogs aren't good at generalizing. There's nothing inherently wrong with saying No, but it doesn't give them enough information. Say that your dog jumps on people. If you say No, the dog might get that something is wrong, but he or she doesn't know what. Maybe my person will be happier if I jump higher? 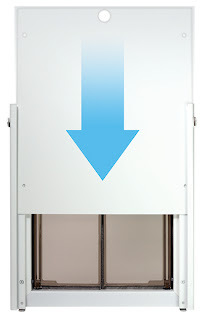 Or if I jump more to the right? Consistently saying "Sit" is more likely to produce a good behavior; the dog will understand what you want. On of my dogs thinks bikes and motorcycles are annoying things that should be herded. She is part Border Collie, and trust me, they'll herd anything. She wants the bikes to stand still in a neat little group. If we're out walking and she sees a bike she'll start barking like crazy and tug on the leash. I'm sure she thinks I'm pretty silly; if I'd just let go she could run over there and teach the bike to behave! I've said No for about a year to no avail. The last couple of weeks I've changed my behavior, and every time we see a bike I tell her to sit. Now she looks up at me as if asking, "Do I have to?" and I nod and say "Sit." She sits down and watches the bike. No more crazy struggle! Win! Norman the scooter dog rides his scooter through placing his front paws on the handle, one back paw on the scooter, and propels himself with his other back paw. Besides scooters he can also ride a bike and a skateboard. Norman has become quite the celebrity, and has amongst other things appeared on The Late Show with David Letterman, and on the Cartoon Network. Last week he became the Guinness World Record holder as fastest dog on a scooter. He needed to ride 30 meters in less than 30 seconds. He went almost two feet further, and needed only 20 seconds. 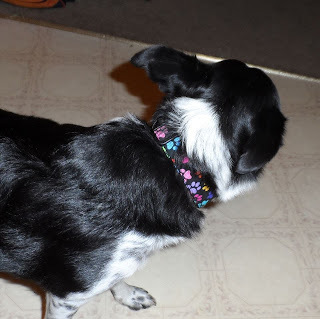 Product test: hand crafted collar from Montana Grrl Critter Gear! Social media has changed the world in exciting ways. I made a new friend on Twitter the other day, and she manufactures and sells dog collars, leashes, bandanas, and other pet related products. The company's name is Montana Grrl Critter Gear. I have tried a collar, and I'm so impressed I want to spread the word. The products are hand crafted in the USA. The collar is washable, sturdy, and beautiful. Right out of the package you can tell it's made with love and an eye for detail. Everything down to the packaging itself is thought through and beautiful! from Montana Grrl Critter Gear! 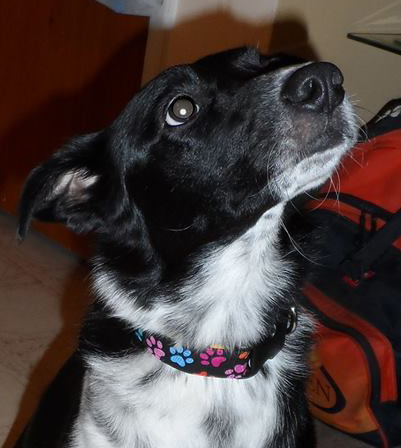 Topper is usually less than impressed with cameras, but he agreed to model, so everyone could see how handsome he looks in his new collar. It is very well made with sturdy seams and hardware. There's a wide variety of patterns, colors, and products to choose from, and I will definitely get more products for "my gang" from Montana Grrl Critter Gear. The company has its own website here, and can also be found on Etsy. Breed Specific Legislation - the idea of banning certain dog breeds - is popular amongst some people afraid of dogs. It doesn't work. Looking at statistics from areas that implement Breed Specific Legislation, the public safety benefit is unmeasurable, while loved pets and service dogs are ripped away from their families and killed because they happen to be an outlawed breed. I'm not saying that everyone has to love every kind of animal, but legislation stemming out of fear is rarely effective. May 24th, Governor Brian Sandoval signed Nevada AB 110, stating "a local authority shall not adopt or enforce an ordinance or regulation that deems a dog dangerous or vicious based solely on the breed of dog." Amongst the indirect losses, the investigators found people moving away from the county because of BSL. Tourism decreased because people with banned breed can't - or won't - visit. And, there is the loss of trained service dogs, not to mention the heartbreak of families who lose their pet. 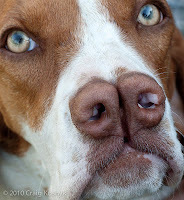 The ASPCA states the problem is never the breed, but the way a dog is treated by the humans around it. The three most aggressive breeds are actually the Dachshund, the Chihuahua, and the Jack Russell Terrier. Ironically, none of these have ever been covered by a breed specific ban. These are fairly small dogs and those who worry about dog bites might say they'd rather have a Jack Russell run up and bite them than a Pitbull. The point is that owners must take responsibility for their dogs, train them, and socialize them, whether they're large or small. The CDC (Center for Disease Control) also made a study on dog bite fatalities in the US and have published an interesting fact sheet. They conclude that each year, 4.7 million Americans are bitten by dogs. These bites result in approximately 16 fatalities. According to the fact sheet, the data on which breeds might be more dangerous is inconclusive, and they say, "Many practical alternatives to breed-specific policies exist and hold promise for preventing dog bites." 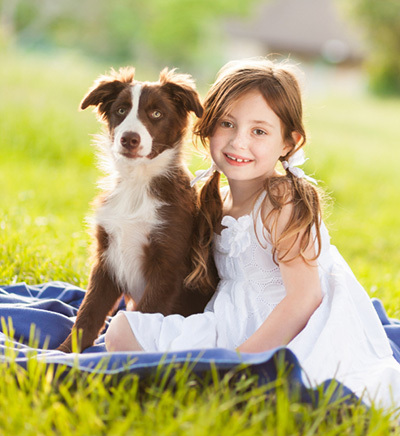 They also give some good hands-on advice on things to consider before getting a dog, and on how to prevent dog bites. What are the alternatives to BSL? Education, enforced leash laws, strong animal abuse and dog fighting laws, and owner accountability are a few examples. 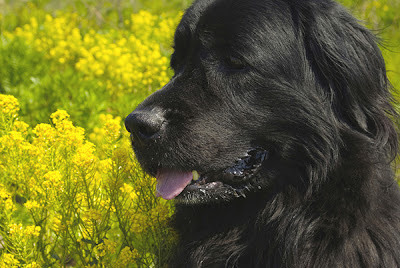 The Newfoundland is a Canadian dog originally bred and used as a working dog for fishermen. They are known for their giant size - some males weigh over 200 lbs - tremendous strength, calm disposition, and loyalty. The Newfoundland is also known as the "Gentle Giant." They excel at water rescue, because they have great lung capacity for swimming long distances. They are also strong enough to take on rough ocean waves and powerful tides. Our friends at Katoby Distribution in Canada are running a Campaign for Rescue contest. 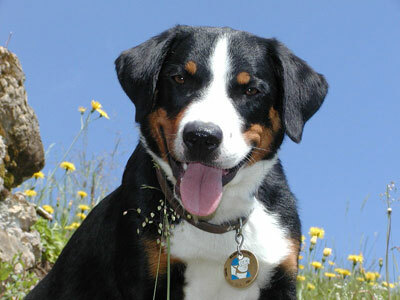 It is intended to help spread awareness of various rescue groups across Canada. Anyone can nominate a Canadian rescue, it's possible to vote every day, and the four winning rescues will receive great prize packages. There is dog food, a PlexiDor, blankets, dog collars, toys, and much more. You can read more about the contest here, and go here to participate! Here in Florida the weather is rarely cold. In my personal opinion there are a few days each winter that are warm, and the rest of the year goes from hot to hotter. Thank goodness for AC! As a human, I can choose to stay inside in the air conditioning. I can go to the beach and mosey around in sandals. It's not quite that easy for pets. They are at our mercy. Luckily, it's easy for us to make summer better for them. Asphalt becomes hot, and pets walk barefoot. Press your palm against the asphalt and keep it there for at least five seconds. If it's too hot for you to do this, it's too hot for your pets to walk on. Cars also grow hot quickly. 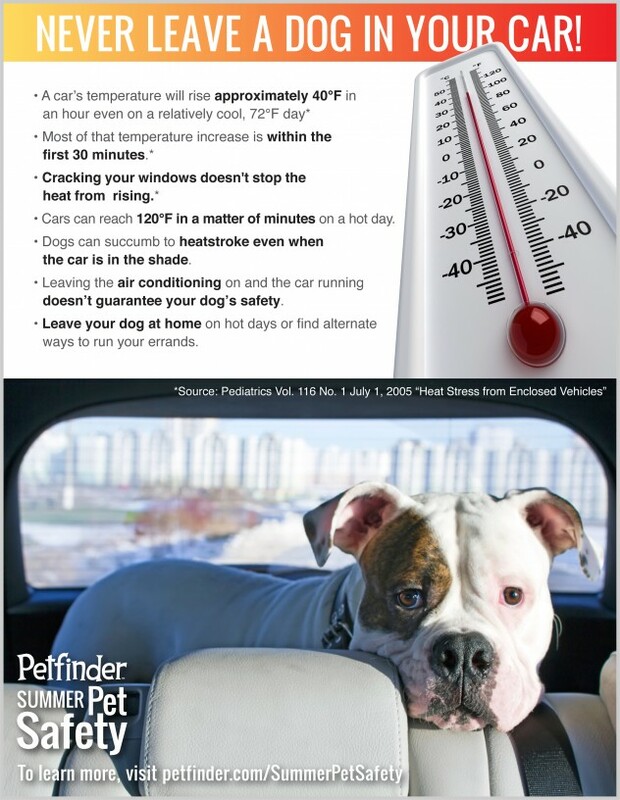 It's easy to think "it's not all that warm" but both pets and children are sensitive to heat. They will die if left alone in the car. On a hot day, the interior of a car reaches 120 F in a matter of minutes. If your pet is outside in the yard, make sure there's shade and plenty of fresh water. Best is to make sure they stay inside, in the AC, during the day. Petfinder.com has an information campaign right now on how to best care for our furry friends in the summer heat. 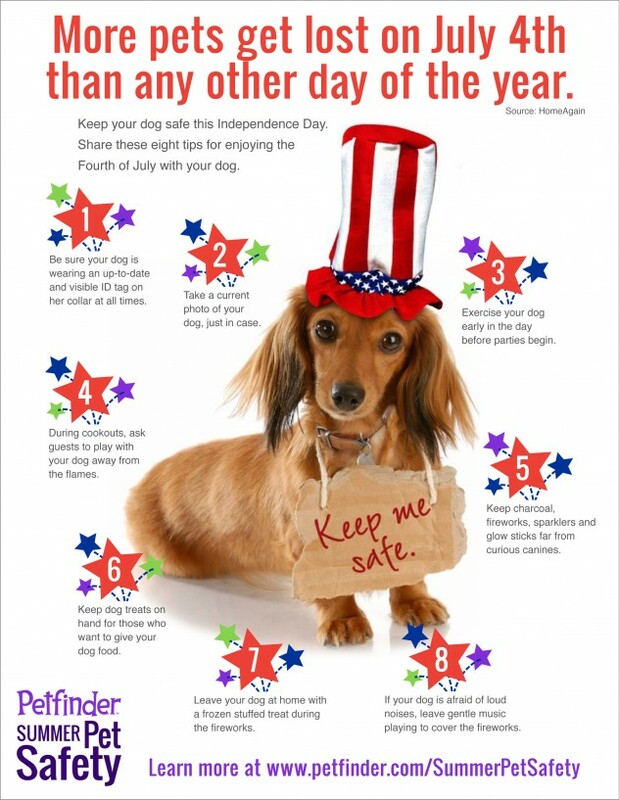 When they point out that more pets are lost on 4th of July than on any other day of the year it makes sense, but I wouldn't have thought of it myself. Here are a couple of the infographics Petfinder has available on their website. Spread the word! Let's all stay safe and happy, and have a great July 4th!